After the initial set-up, caring for land hermit crabs is extremely easy. The perfect pets for the lazy animal lover. Often treated as "throw-away" pets, these little critters are cute, highly intelligent, silly, hearty, & can outlive most pets. It all started seven years ago when my son came home with a little Ecuadorian hermit crab he had won at a fair. He had named him Harold, and Harold was hands-down adorable. I didn't know a thing about how to take care of little Harold, and I innately knew that the barren plastic container he came home in was somehow not right. To me, it looked uncomfortable and unnatural. And so, my mission to learn everything I needed to about hermit crabs, began. couple of them I bought in the beginning (I know animal rights activists deeply frown upon this, but without companionship, I risked watching Harold die). Contrary to popular belief, hermit crabs are extremely social and to live long happy lives, they must have companionship. How did the others come into the colony? Well, I am a member of the Hermit Crab Association and found myself naturally adopting the role of rescuer for people who through one way or another acquired a hermit crab they could no longer care for. I currently have a colony of nine happy, silly crabs. Now I have had some that did not make it as long as they could have. I've sadly lost a couple to having to move residency's while the crabs were molting (if you move a lot, hermit crabs would not be a good choice for you). I've also lost a couple due to other crabs bullying. Bullying of weaker ones happens in nature, and there is not a whole lot you can do unless you catch the crabs in the moment of conflict and can take the crab that is being bullied out and place them into a separate tank for a period. After which you may try to reintroduce them back into the colony in the main crabitat. 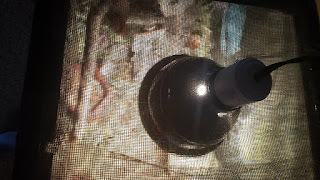 Through many years of observation, trial and error, I have learned the essential basic needs for hermit crabs to live and thrive in captivity. What they love and what they do not love. Here you will find Hermie care simplified. Here is a classic Purple Pincher Hermit Crab. Hermit Crab (also known as the Pacific Hermit Crab). While Purple Pincher's have been known to live 15+ years (and longer if kept well in captivity), the Ecuadorian hermit crab has been known to live 30+ years! Out of the two distinct types that are commonly found in the U.S., the Purple Pincher is definitely the most common. While these two crabs may differ slightly in appearance, their needs are virtually the same. Land Hermit Crabs are excellent pets for the lazy person. With the proper set-up, these hearty little scavengers require minimal cleanup, minimal care, and low to almost no feeding cost while supplying endless visual entertainment. to live). This will be home until the time comes again to bury oneself and molt. Once the freshly molted crab re-emerges to the land surface, he will begin to search for a shell that is slightly larger than the original. Contrary to popular belief, hermit crabs depend on social activity. They travel in droves, and it is not uncommon to find hundreds of hermit crabs traveling and living on top of each other (literally, they love to climb and sit on one another). They have also been known to travel great distances together. Hermit crabs are by nature, very curious and social animals. Therefore, it is highly recommended that if you intend to care for a hermit crab, you adopt at least one or two more. They do not survive happily or very long without companionship. Land Hermit Crabs have modified gills. These are stiffer gills than a fish possesses—located in the brachial chamber that together acts as lungs. Therefore, it is necessary to their survival that they have moist, salty air to breath within their environment. 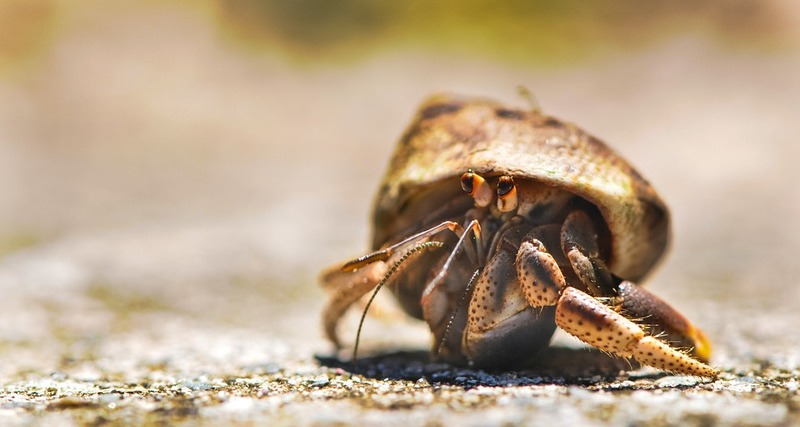 Contrary to popular belief, hermit crabs depend on social activity. molting process becomes longer in time. While a small young crab may bury and molt for a week or two, the larger crab could spend several months below the surface. The molting process can cause a human caretaker to worry and wonder if the crab has died. Never, under any circumstances, disturb or dig-up a molting crab. When a crab molts, they enter into a catatonic state. This is an extremely delicate and stressful period for the crab. If they are awakened and disturbed during this state, it will undoubtedly cause death. One of my hermit crabs enjoying a delicious meal of sun dried baby shrimp and dry oats. 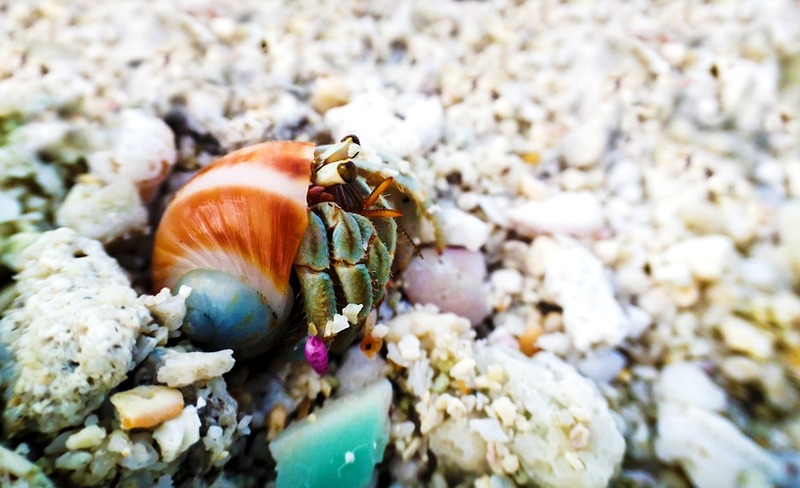 Hermit Crabs are scavengers and are all about recycling. From their found snail shells that they call home, to what they eat. In the wild, they can be found eating anything from tree bark, seaweed, carcasses, to fruit. Since they are not picky eaters, I've had fun over the years experimenting with my hermies to see what they like best. The awesome part is that most of the food, we already have in our house. Since they are tiny little critters, they only require a minuscule amount. You can honestly feed your crabs well without even buying anything more than what you buy your family to eat. Dry Old Fashioned Oats (I use these in my smoothies, so they are always in the house. My hermies LOVE dry oats). Having two different water bowls sounds more complicated than it is. In my 75 gallon tank, I have a large dog food dish that I use as the saltwater container with a bubbler tube running to it. Not only does the bubbler add a nice zen-like sound in the background, but it also helps to disperse the salty essence into the air (like they would have if they lived out in the wild). While the hermies may venture over to the salt water pool from time-to-time, they prefer to bath and drink in the fresh water dish. Since the water is in a constant state of evaporation, I find that all I need to do to maintain the salt water bowl is to wipe it out with a clean napkin every few weeks or so and add fresh non-chlorinated water along with Instant Ocean salt. I keep a small fresh water dish near their food bowl. Here the hermit crabs come to drink, clean, and store water within their shells. The water should be deep enough for them to submerge yet not too deep for your smallest crab. Believe it or not, a little crab can drown. Both water bowls should contain fresh water. Never use regular unfiltered tap water. There is far too many additives that can potentially be poisonous for your little crabs. You can use either distilled bottled water or if you have a home filtration system like I do, you may use that. A crabitat tank should be no less than 10 gallons. To figure out the size of tank that you will need, you must base this number off of a common rule of thumb; which is one medium sized crab per every three gallons. If you have large crabs, then you can figure one large crab per every four gallons, and one small crab per every two gallons. This is my 75-gallon crabitat. I've labeled each vital component. Click to see more closely. this moment, my crabs are highly active, and the current temperature is sitting at 80 degrees Fahrenheit, and the humidity is at exactly 75%. If you find that your crabs have been acting lethargic and move very very slowly for an extended amount of time, it could be due to the temperature and humidity. Cooler temps and low humidity can make a crab highly inactive. 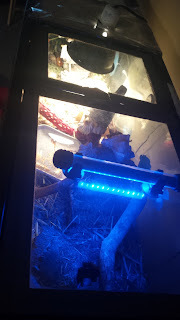 Many people use a digital hygrometer (a battery powered device that displays the temperature and humidity) in their crabitats. I Acurite suction cup thermometer I got for less than a dollar at Walmart and a basic Fluker's hygrometer. To maintain the needed heat levels throughout the year, you will need to purchase an inexpensive heat lamp. For this (as seen in the photo), I use the Fluker's mini sun dome lamp. For a long time, I made sure I was using the "daylight" bulbs for reptile habitats. These specialty bulbs became a problem for me, since every two to four weeks; the bulbs would blow. 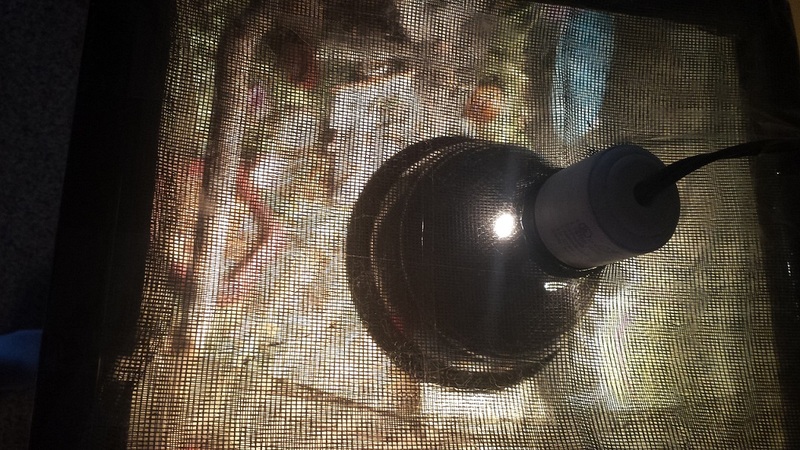 Finally, I used a regular incandescent light bulb to see how it would hold up and if it could do the job (keep in mind that there is a limit of wattage the lamp can use, you should be okay as long as you stay below that amount). Low and behold, the regular, much cheaper light bulb did the job! The trick is to be sure that you have your tank closed up enough to hold in the heat. To do this, I took my 75-gallon tank (that I bought for $75.00 from a guy selling it in a local classifieds ad *with stand*) and removed the aquarium lids. Instead, I had old cheap photo frames that had glass panels in them. I took the panels and found that they lined up perfectly with the top of the aquarium. I simply took duct tape and lined the edges of each panel with the duct tape and gently laid them on top of the tank. Having the glass at the top allows the heat and humidity to stay within the hermies environment. I've left a large enough opening to add in a screen portion to the top, to where I have cut a hole only large enough to hold the lamp steady. Hermit crabs like to climb, so I've made sure to keep the tallest climbing objects far enough away from the lamp. But they are smart little critters, and I've never had any issue with them trying to get close to it. I've connected the bubbler and the lamp to a power strip. In the morning, I switch the power strip to "On" and when it begins to become dusk, I switch the power strip to "Off". I keep a small led blue light over one portion of the tank. This gives a nice night time effect. Now, people can get crazy with the countless options and suggestions out there as to what is best to use for your hermies. Again, I like to keep things simple. I purchased two 50lb bags of play sand from my local Lowes store for a few dollars each (remember, I have a 75-gallon tank). Sand is perfect for hermit crabs since living near and on beaches is their natural environment. Sand is easy for them to dig and bury themselves in, therefore creating a molting-friendly environment. TIP: Look at your largest crab. The depth of the substrate should be at least three times his shell size (generally three to six inches in depth). I like to spread Timothy Hay (this can be found at most stores that have pet supplies) along the top of the sand. It is pretty, and the crabs love to eat it as well as burrow in it. 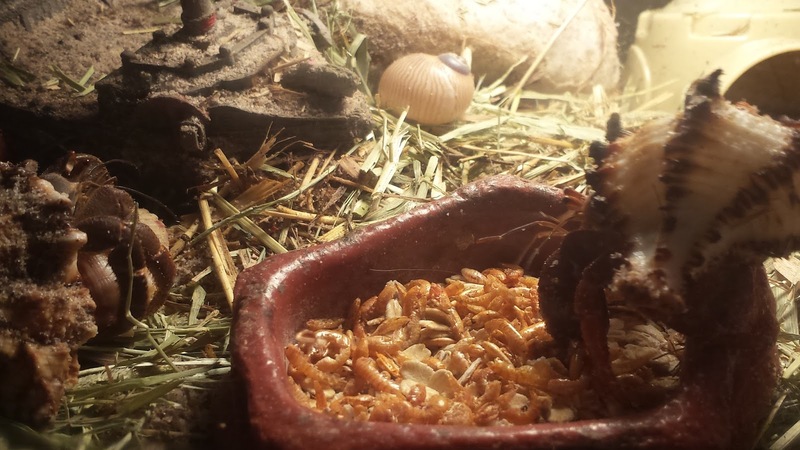 Hermit crabs are extremely curious and adventurous little animals. You'll notice this after every time you clean out the tank. They love it when there is new stuff added and changed around. For this reason, it is a must that you supply them with stimuli. I've taken pecan tree branches and strategically spread them out in the tank, so they have plenty of places to climb and hang from (they love to hang upside down). You'll also see I've added some huts (these are important as hermies need places to hide in), as well as a pirate ship to climb and a garden gnome! Get creative; you can make your crabitat any theme you'd like. At Christmas time, I put little Santa statues in there with them. Hermit crabs need plenty of space, huts to hide in, and plenty of toys and obstacles. Here is a list of the absolute essential must-haves when caring for Hermit Crabs. Plenty of shells in various sizes; to encourage molting and growth; it is vital to have a broad range of turbo style snail shells for them to change in and out of. The best place to buy these in bulk is on Ebay. Just type in "turbo shells" or "hermit crab shells.". Hermit crabs prefer all natural shells (stay away from the painted ones, they are toxic). A hermie's favorite kind of turbo shell is the pearl inlay type (they are silky shiny looking on the inside). A controlled climate. Keeping the temperature between 74 degrees Fahrenheit and 85 degrees, while maintaining the humidity between 60% to 85%. Change the food out every two to three days. Change the fresh water bowl out whenever it is dirty (the hermit crabs will drag sand and sometimes food into the water). Wipe out the salt water bowl when it has gotten low and replenish it with fresh water and the appropriate amount of Instant Ocean (read the box for specifications). Clean the tank every month to two months. I do this by removing all surface objects (rinsing them with fresh water *not chlorinated*, and raking and moving the top layer of sand. This allows the new sand from below to come to the surface. If it is exceptionally mucky in any way, I will scoop those portions out and throw it away. NEVER use chemical cleaning products in your crabitat. This is for obvious reasons; you don't want to kill your hermies. Instead, you may use vinegar and lemon juice to clean the inside glass. Plain water and a squeegee does wonders. Personally, I do not pick up my hermit crabs (unless I need to move them out of the way when I am maintaining their tank). I enjoy watching them thrive in their miniaturized natural world with as little interruption by me as possible. 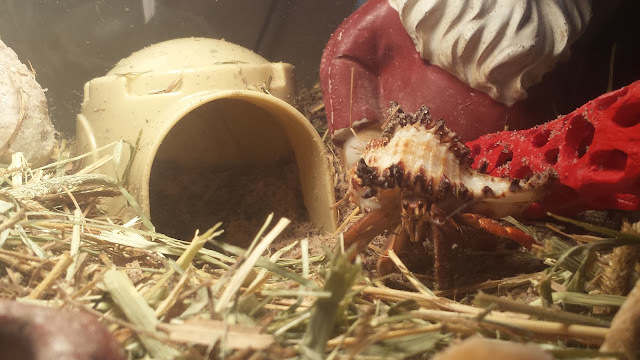 Some people insist on picking their hermit crabs up and "playing" with them, and that's fine (if you choose to do this, be cautious, you could scare them, and they will pinch you). However, it is worth noting that you may re-think handling your crab too much. They need high humidity to breathe properly, and by exposing them to the drier air outside of their controlled environment, you are essentially causing undue stress for your little guy, which in turn can cause many health problems for him. I'm of the mind that they don't have people typically picking them up in the wild, and probably prefer it that way. In conclusion, this article should serve as a jumping off point for you as you begin your hermit crab parenting journey. There are many different ways and methods that various people all over the web utilize in caring for their own crabs. 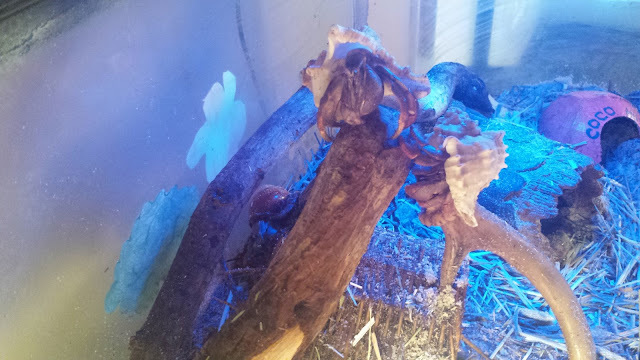 Using the above basic techniques for many years myself, I have successfully cared for (and still do) many hermit crabs. While upon first glance it seems as though their needs are many and that there is a lot of work to set them up correctly. I promise you, though, once you have taken the time and energy to build them a perfect little environment, you will find that they are extremely low maintenance as well as the least expensive pets you could have. They don't take much to be happy and thrive. This is amazing! I'm so thankful for your guidance with these little guys. Your crabitat is stunning and so creative!